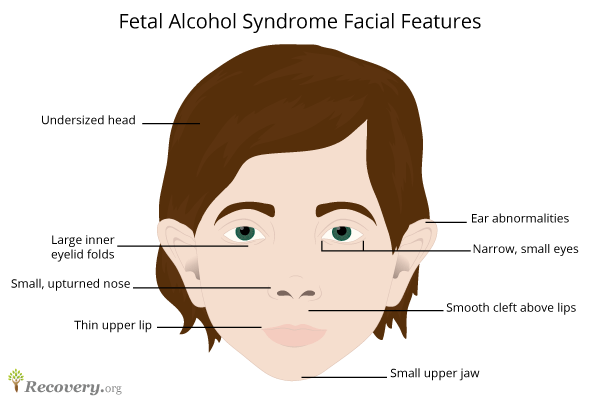 Fetal alcohol syndrome (FAS) is a condition caused by exposure to alcohol in the womb. People with FAS may have distinctive facial features, cognitive problems and impaired growth. Getting treatment early can help prevent some of the problems people with FAS may develop later in life, such as legal issues, mental health disorders and being dependent on a caregiver. Who Answers? to learn more about recovery options. Prenatal exposure to alcohol can lead to fetal alcohol syndrome. When a mother drinks alcohol while pregnant, it passes through the placental circulation to the embryo or fetus and can affect the unborn baby’s health. 2 For this reason, doctors recommend that expecting mothers don’t drink alcohol while pregnant. Prenatal exposure to alcohol can disrupt proper development and lead to fetal alcohol syndrome. Alcohol is detrimental to development at any stage of pregnancy. But it is particularly damaging in the first 3 months. 2 No matter what you might hear, it is not “safe” to drink alcohol in even mild or moderate amounts during pregnancy. Fetal alcohol syndrome does not have a cure. But treatment can help address problems related to it. Poor prenatal and postnatal growth. Difficulties with speech, social skills, coordination, and/or cognition. Heart defects (atrial and ventricular septal defect). Trouble understanding cause and effect. Unable to remember and follow instructions. If your child is diagnosed with fetal alcohol syndrome or a fetal alcohol spectrum disorder, he or she should receive treatment to address any physical or cognitive problems. Confinement in detention, jail, prison, an addiction treatment setting, or a psychiatric facility. Receiving a diagnosis at an early age. Being raised in a stable, loving household. Being involved in social services and special education. Who Answers? to speak to a treatment specialist about which type of rehab is best for you. As stated earlier, fetal alcohol syndrome does not have a cure. But some interventions can help improve the lives of people who have this condition. If your child is diagnosed with fetal alcohol syndrome, get him or her assessed by a team of professionals who specialize in treating children with this disorder. They will be able to create a treatment plan designed specifically to meet your child’s needs. The plan could include a home-based program as well as collaboration between language/speech therapists, psychologists, and social workers, depending on the child’s strengths and weaknesses. Set short-term, achievable goals to boost the child’s confidence and reinforce positive behaviors. Focus on his or her strengths when setting these goals. Take note of what motivates the child and use it to develop rewards and incentives. Reward positive behaviors and cooperation. Medication: The Food and Drug Administration has not approved any medication for the treatment of FAS. But your child may be prescribed stimulants, antidepressants, or neuroleptics to address different behavioral or mental problems. [li]Parental training: This intervention teaches the parents how to help their children develop social and cognitive skills. Behavioral and educational therapy: Some scientifically tested interventions may help children with developmental disabilities associated with FAS: executive functioning training, parent-child interaction therapy, friendship training, parenting and behavior management training, and specialized math tutoring. Medical care: Depending on the nature of the symptoms, different specialists may need to closely monitor the child. Alternative approaches: Some untested therapies may be helpful, including biofeedback, yoga, creative art therapy, auditory training, animal-assisted therapy, and relaxation therapy. Again, the earlier your child receives treatment for fetal alcohol syndrome, the better. If you suspect that your child has a fetal alcohol spectrum disorder, make an appointment with his or her pediatrician right away. The best way to prevent fetal alcohol syndrome is to abstain from alcohol while pregnant. 2 If you are trying to get pregnant, avoid drinking alcohol while you are attempting to conceive. This precaution will help prevent accidental consumption in the early stages of pregnancy. 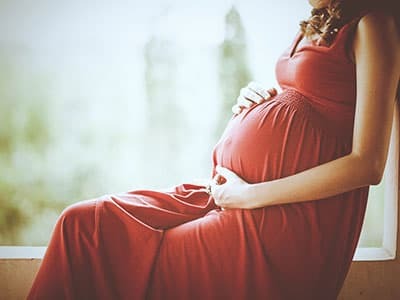 Some mothers are more likely to give birth to a baby with a fetal alcohol spectrum disorder than others due to environmental and mental health factors. Personal and family history of alcohol consumption and abuse. Previous treatment for substance abuse or mental health issues. Lack of health care access. Previously given birth to a baby with a FASD. 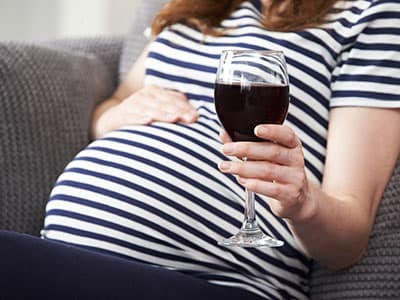 If you drink and are an expecting mother or are trying to conceive, contact your physician about preventative treatments and counseling to prevent or lower the risk of having a baby with fetal alcohol syndrome. Adults with FASD are at risk for victimization, legal problems, and mental health issues. Fetal alcohol syndrome is usually recognizable due to the unique set of facial features associated with the condition. But people with other fetal alcohol spectrum disorders may not display any remarkable physical characteristics. Many adults living with FASDs have not been properly diagnosed and experience deficits in major areas of life as a result. Often, insurance disability classifications don’t include FASDs as a qualifying condition. In addition, many people are not aware of FASDs, which means that adults suffering from these disorders tend to have employment and housing problems. Dependence on a caregiver and an inability to live alone. 1% reported current heavy drinking. Nearly 4% reported current binge drinking. Nearly 11% reported current alcohol consumption. Just over 10% reported binge drinking within the first 3 months. Just under 30% of study participants admitted to drinking during pregnancy. About 8% reported binge drinking (the majority being during the first trimester). If you are pregnant and would like to get help for an alcohol problem, or if you are looking for substance abuse treatment for yourself or a loved one, call 1-888-319-2606 Who Answers? to speak to a recovery center advisor today.
. Substance Abuse and Mental Health Services Administration (SAMHSA). (2014). Addressing Fetal Alcohol Spectrum Disorders.
. National Library of Medicine. (2014). Fetal alcohol syndrome: MedlinePlus Medical Encyclopedia.
. Spohr, H., Willms, J., & Steinhausen, H. (1993). Prenatal alcohol exposure and long-term developmental consequences. The Lancet, 341(8850), 907-910.
. Streissguth, A., Bookstein, F., Barr, H., Sampson, P., O’malley, K., & Young, J. (2004). Risk Factors for Adverse Life Outcomes in Fetal Alcohol Syndrome and Fetal Alcohol Effects. Journal of Developmental & Behavioral Pediatrics, 25(4), 228-238.
. Centers for Disease Control and Prevention. (2015). Fetal Alcohol Spectrum Disorders (FASDs): Data & Statistics.
. Minnesota Department of Health. Fetal Alcohol Spectrum Disorder.
. Wattendorf, D. (2005). Fetal Alcohol Spectrum Disorders. American Family Physician, 72(2), 279-285.
. National Organization on Fetal Alcohol Syndrome. Adults Living with FASD.
. Centers for Disease Control and Prevention. (2014). Fetal Alcohol Spectrum Disorders (FASDs): Treatments.